The stress of modern life feels a million miles away when you holiday on Cayo Largo, a small and unspoiled resort island off the coast of Cuba. Kick off your visit on the 15th (Sun): enjoy the sand and surf at Playa Paraiso and then enjoy the sand and surf at Playa mal tiempo. Get ready for a full day of sightseeing on the next day: look for all kinds of wild species at Sea Turtle Hatchery and then kick back and relax at Sirena Beach. To see reviews, where to stay, maps, and more tourist information, you can read our Cayo Largo trip builder. Norfolk, USA to Cayo Largo is an approximately 14-hour flight. Plan for somewhat warmer temperatures traveling from Norfolk in April, with highs in Cayo Largo at 85°F and lows at 69°F. Wrap up your sightseeing on the 16th (Mon) to allow time to travel to Santiago de Cuba. Santiago de Cuba has taken almost as much influence from Haiti and the Dominican Republic as it has from Havana, distilling a concoction of cultures to create a city with a distinct identity. On the 17th (Tue), take an in-depth tour of Casa de Diego Velazquez, take in the spiritual surroundings of Cathedral of Our Lady of the Assumption, then explore the different monuments and memorials at Cementerio Santa Ifigenia, then contemplate the long history of Moncada Barracks, and finally step into the grandiose world of San Pedro de la Roca del Morro Castle. For traveler tips, reviews, more things to do, and tourist information, read Santiago de Cuba itinerary planner. Traveling by flight from Cayo Largo to Santiago de Cuba takes 1.5 hours. In April in Santiago de Cuba, expect temperatures between 85°F during the day and 72°F at night. Finish up your sightseeing early on the 18th (Wed) so you can travel to Camaguey. Camaguey encompasses the central section of Cuba and remains largely agricultural, its economy dependent on small-scale cattle raising and fruit production. On the 18th (Wed), steep yourself in history at Inglesia de Nuestra Senora de la Merced, admire the architecture and history at Plaza del Carmen, then kick back and relax at Coco Beach, then view the masterpieces at Martha Jimenez's Studio Workshop, and finally contemplate the long history of Casa Natal del Mayor (Ignacio Agramonte). For traveler tips and other tourist information, use the Camaguey itinerary planner. You can fly from Santiago de Cuba to Camaguey in 1.5 hours. Other options are to take a train; or drive. Expect a daytime high around 89°F in April, and nighttime lows around 69°F. On the 19th (Thu), wrap the sightseeing up by early afternoon so you can drive to Trinidad. Built on sugar and seemingly preserved in molasses, the town of Trinidad attracts visitors with its well-aged 19th century architecture and rustic charm, showcasing the sounds, scents, and sights of days gone by. You'll discover tucked-away gems like Romance Museum and Horseback Riding Tours. 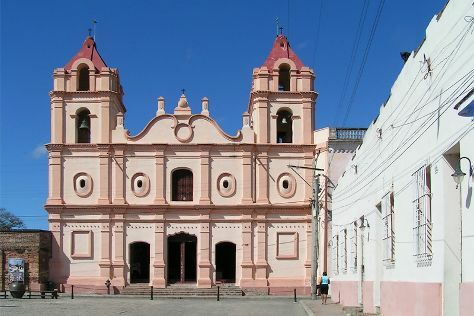 Get a sense of the local culture at Iglesia Parroquial Mayor del Espiritu Santo and Iznaga Tower. There's still lots to do: take in the awesome beauty at Topes de Collantes, view the masterpieces at Galerie D'Art Calleyro, see the interesting displays at Museo de Arquitectura Colonial, and admire the sheer force of Salto del Caburni. To find maps, ratings, other places to visit, and more tourist information, read Trinidad travel planner. You can drive from Camaguey to Trinidad in 4 hours. Other options are to do a combination of train and taxi; or take a bus. In April, daily temperatures in Trinidad can reach 88°F, while at night they dip to 70°F. Finish up your sightseeing early on the 23rd (Mon) so you can go by car to Cienfuegos. The city of Cienfuegos sits in a scenic natural bay, attracting visitors from across the country and further afield since its establishment in the early 19th century. Start off your visit on the 24th (Tue): explore the activities along Guanaroca Lagoon, take a stroll through Punta Gorda, then contemplate the long history of Palacio de Valle, and finally make a trip to Parque Jose Marti. Here are some ideas for day two: pause for some serene contemplation at Catedral de la Purisima Concepcion, admire nature's wide array of creatures at Delfinario de Cienfuegos, and then kick back and relax at Rancho Luna Beach. To see other places to visit, reviews, and tourist information, go to the Cienfuegos travel itinerary creator. You can drive from Trinidad to Cienfuegos in 1.5 hours. Another option is to take a bus. In April, plan for daily highs up to 88°F, and evening lows to 70°F. Cap off your sightseeing on the 25th (Wed) early enough to travel back home.